Tamara Whittaker has been named Communications Director for Ad 2 Tampa Bay. Ginger Reichl has been named Director – ADDY Award Entries for theTampa Bay Advertising Federation. Jeff Zampino has been named Director – ADDY Award Judging for theTampa Bay Advertising Federation. Pinstripe Marketing, Inc., a St. Petersburg‐based leader in professional services marketing, has been granted national Women’s Business Enterprise (WBE) certification by the Women’s Business Enterprise National Council (WBENC) through its regional affiliate, the Women’s Business Development Center. The announcement was made today by Ginger Reichl, the agency’s president. Pinstripe Marketing’s official WBE status is a response to new expectations in the marketplace. “Historically, WBE certification was only necessary to serve governments and other public agencies,” Reichl explains, “but in recent years, our clients and others in the private sector have made diversity, both in their own staff and among their vendors, suppliers and consultants, a significant priority. Pinstripe Marketing has been selected by Xerox Corporation to implement a channel marketing campaign to support a community of Xerox business partners. The campaign includes the development of marketing materials for nearly 100 business partners to help them promote Xerox document management solutions to their end users. Materials include a brochure, email campaign and an web-based survey with incentives. Pinstripe is managing the design and execution of the marketing campaign on behalf of the business partners so they may continue to focus on their core competencies of account management and technical support. 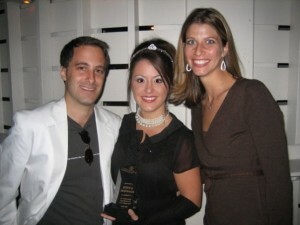 Ad 2 Tampa Bay’s Communications Director, Jessica McDonald, received the 2007 Pinstripe Service Excellence Award. Presented annually, Pinstripe Marketing presents the award to the Ad 2 member who demonstrates the most outstanding contributions to the organization. Ad 2 Tampa Bay launched AdCast, a live Internet-broadcasted video program in September, 2006. The young professional-targeted program broadcasts the latest information on Tampa Bay area events, professional development, hot trends in marketing, and new talent in the advertising world. AdCast also promotes other young professional organizations, charities and fundraising events. McDonald quickly stepped in as co-host for the monthly broadcast, lead script writer, and scheduler for guests. Since its launch, AdCast has become an important communication tool for Ad 2 and local young professional organizations. The video segments are archived on Google Video and available by searching for “AdCast”. “As communication professionals, it was only natural for Ad 2 Tampa Bay to take the lead in promoting other local young professionals. Jessica is an impressive leader who stands out among her peers, and her initiative has made AdCast a success in a very short amount of time,” said Ginger Reichl, president of Pinstripe Marketing and former Ad 2 president. McDonald also oversees Ad 2 Tampa Bay’s annual communication plan and serves as the organization’s public relations contact. McDonald is a graduate student at the University of South Floridaand the Marketing Promotions Manager for Tampa Bay & Company, a non-profit organization responsible for promoting the Tampa Bay area as a destination for visitors and conventions. Ad 2 Tampa Bay, Inc., an affiliate of the American Advertising Federation, is a non-profit organization of advertising professionals under the age of 32. As a nine-time National Ad 2 Club of the Year, the organization takes pride in providing both members and the community with quality educational programs, national award-winning public service campaigns, professional interaction, member employment services, fun-filled social events and much more. The American Marketing Association Tampa Bay Chapter (AMATBC) is proud to announce its new leadership. Goals for the new board include increasing service to area non‐profits, increasing membership and benefits as well as raising visibility for the chapter through its new branding campaign. Karin Arden, president. Arden is a partner with JFD Advertising & Public Relations in Tampa. Terre Paz, chairman of the board. Paz is with Ryah Creative Group in Palm Harbor. Financial Services Inc. in St. Petersburg. Don Gage, vice president of membership/volunteers. Gage is owner of GAGE in Palm Harbor. Communications, LLC, in St. Petersburg. Ginger Reichl, vice president collegiate relations. Reichl is president of Pinstripe Marketing in St.
assistant product marketing manager, membership with AAA Auto Club South in Tampa. among others. For more information about events, call Jim Slusser at 727‐865‐7687.